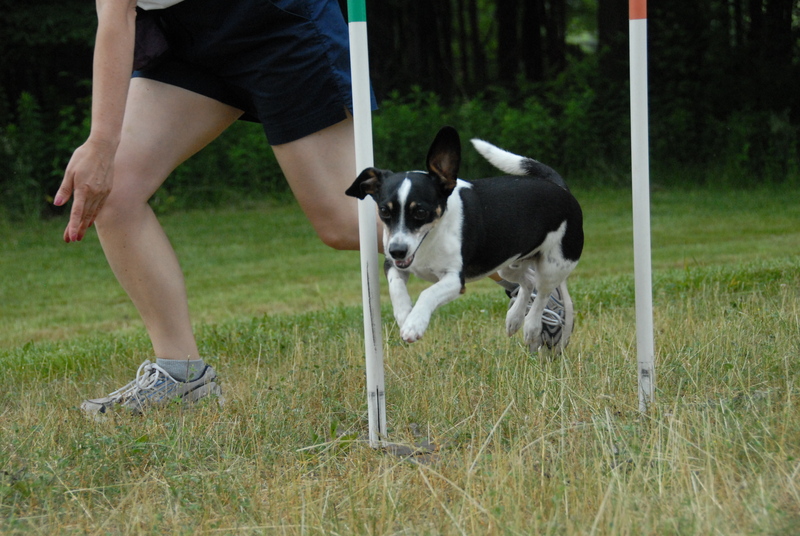 It was a comfortable morning at St. Huberts for the June 5 and 6, 2010 CPE, SCOR agility trial. Dry and nice but the but the forecast was for some heat and humidity with the next day slated to be hot with some rain. Kathy drove to the site and I biked so she got there at about 7:30 while I got there about 7:45. I was replete with pastries from the Swiss Chalet bakery and I had my Nikon dSLR, my new Mini DV camcorder and my new iPad. I took lots of pictures of the other dogs, video taped Scraps and Kathy and I even finger-painted the picture below with my iPad during the trial; so check it all out below. Drawn using ArtStudio for the iPad during the trial. Except for one hot day a month ago, Scraps has not practiced on real equipment since our last class with Sherry in the fall. We couldn’t have expected much out of the mutt, but when expectations are down, Scraps pulls off a perfect 5-for-5 qualifying performances. He has never done that before. Jumpers Level 3 – 8″ – First run of the day and you never know how it is going to go. He started nicely smooth and focused, then he missed a jump and took it backwards in his attempt to correct the mistake. It was a 5-fault error but not enough to disqualify him, so he took home a 2nd place ribbon in this event in his 32.60 second qualifying run. 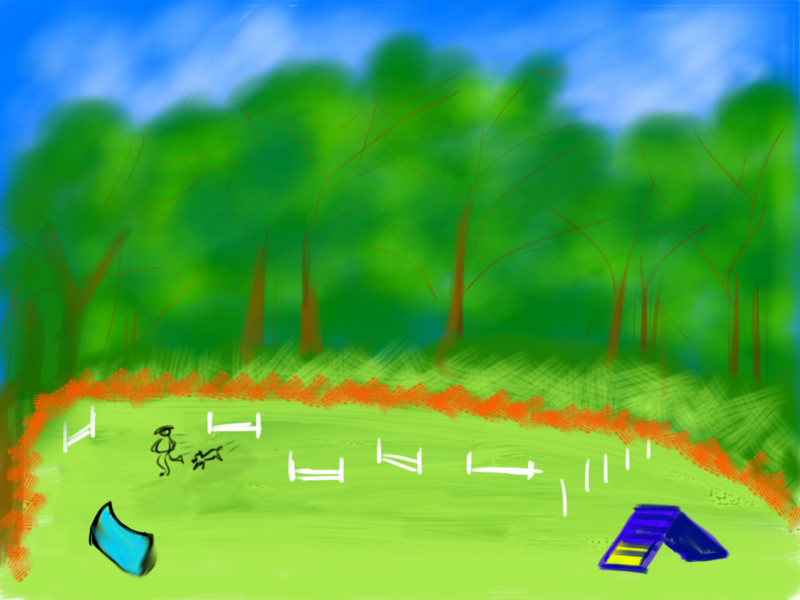 Colors Level 3 – 8″ – For this run I ran to the far out-of the way corner of the field to video the run, not far enough because Scraps found me and ran over to me costing valuable seconds, but not enough to disqualify him after getting back on track and completing the course. Actually, it was a clean run with 0 faults with a 2nd place run in 38.19 seconds. For the remaining runs I stayed back at the course entrance by our tent to video Scraps. Standard Level 1 – 8″ – This is about our only remaining level 1 game and with performances like this one we are soon to be moving up the ladder. He had a qualifying run with only 5 faults from a distraction around a jump where he sniffed the grass and got confused and jumped over a jump backwards. Not enough to disqualify him as he qualified and came in 1st place in 40.61 seconds. In looking at the video tape, we got away with one here. Scraps missed the contact on the plank by an inch and should have been cited for another fault. Jackpot Level 3 – 8″ – This was probably the best run of the day. Kathy and Scraps were racking up points left and right. Jackpot allows a dynamic accumulation of points but Scraps did go over a jump the wrong way again on this run. While it didn’t cost us here, it will in the future especially as we move up in rank or compete in NADAC instead of CPE. 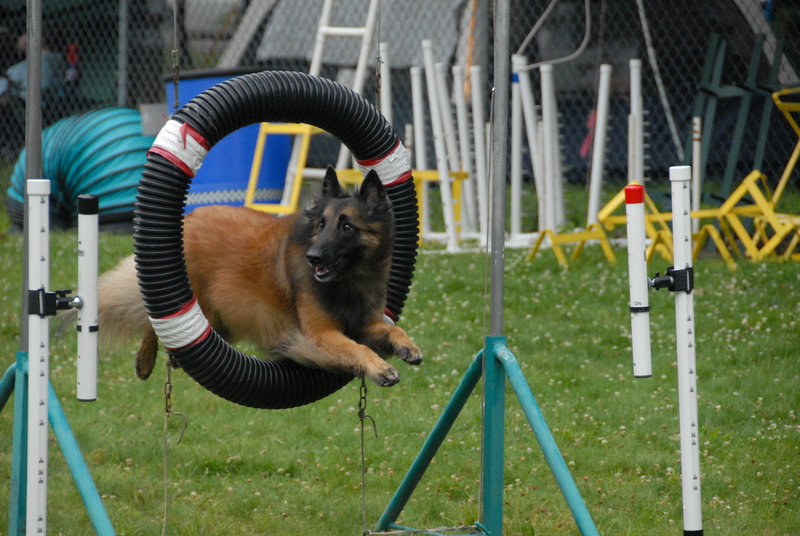 The series of obstacles at a distance at the end of Jackpot were easily handled by Scraps. He had 51 points and a 1st place qualifying run. Snooker Level 3 – 8″ – This was the fifth and final run of the day as the energy sapping weather cooled a bit, just a bit. This was a fast and smooth run with a clapping and hunched over Kathy able to guide and correct Scraps successfully through this snooker course. He almost blew it by being lured into a false tunnel but Kathy’s clap called him away from that tease just in time and went to to easily complete the course for another 2nd place qualifying run in 39.66 seconds with 47 points. This was the the 5th of 5 for qualifying runs for the day the day. I biked home, built up a new sweat, Kathy stayed to help out with the few remaining runs and we ate Tiffany’s for dinner and it’s time to blog and rest for tomorrow is another day. Come Sunday we had more mild weather followed by a little rain shower during the last run for the day. While on June 5 we went 5 for 5, on June 6 we ended up the weekend with six qualifying runs. If you asked me would we be satisfied with 6 qualifying runs out of 10 for the weekend, I would answer “Yes” but after going 5 for 5 on Saturday, a 1 for 5 performance on Sunday is a little of a let down. Fortunately, it wasn’t as hot and as grueling a day as the previous, so it is nothing to complain about. I took many more pictures and have posted them to my Picasa Web Albums. Fullhouse Level 4 – 8″ – Level 4 competition hasn’t been kind to us and we failed to qualify in our level 4 fullhouse run. We only received 13 points before Scraps prematurely jumped on the table in 28.86 seconds and ending his run. That wasn’t enough to even come close to qualifying. After not completing the optional weaves, Scraps didn’t even go into the tunnel which he usually has not problem with, oh well. Standard Level 1 – 8″ – We are still at level 1 for standard but that handicap didn’t help us today as we didn’t qualify here either. We didn’t pickup the scoring sticker either so our run statistics aren’t known expect for the fact the we didn’t qualify. Al I know is that Scraps was distracted by the other photographer and then came across the field looking for me, then he rested in the shade for a few seconds before failing to even cross the finish-line to establish a time, oh well. Wildcard Level 3 – 8″ – Wow, this was the only qualifying run of the day. With 0 faults in 30.39 seconds Scraps took home a first place ribbon. While he was distracted a bit, he managed to hit the poles on the first try and with his quickness was able to complete the run within the alloted time to pull this one out of his a$$. All’s well that ends well. Colors Level 4 – 8″ – Because of our qualifying run the day before we moved up to level 4 for the Sunday run. This didn’t do us any good as we had a non-qualifying run with 15 faults in 33.07 seconds. 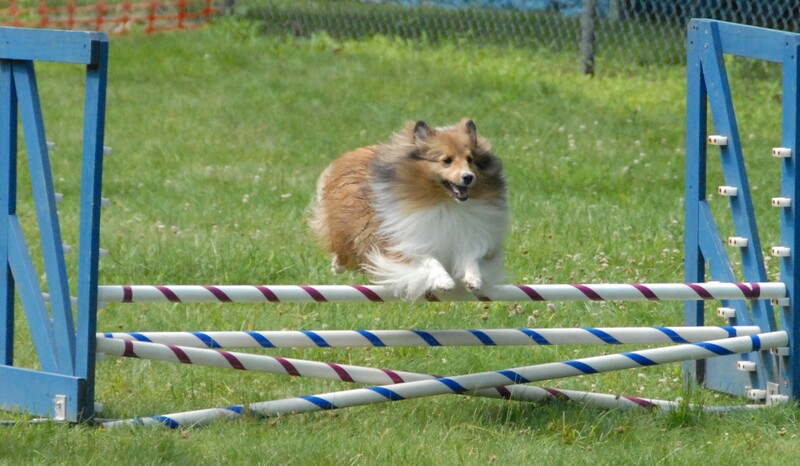 Scraps’ inabfgility to complete the weave poles in this run was his primary downfall, oh well. Jumpers Level 4 – 8″ – Once again, with a qualifying run on the previous day were we afforded the opportunity to move up to level 4 for jumpers and once again we failed to qualify in jumpers as Scraps had a whopping 25 faults in 35.2 seconds. It was raining by the time we got to this last run of the day. Scraps seemed pretty focused and undistracted by the rain, the tricky ambiguous tunnel entrances fooled him at both opportunities and killed his chances for a qualifying run, oh well. So it was a Sunday of “oh wells” but a weekend of “all’s well that ends well” because going six for ten is pretty good for Scraps. One most consider his lack of recent practice and the fact he is now competing in higher levels to appreciate how good he actually is. As we have a summer distance training class, let’s see if we can improve on our handling skills by the time the next trial rolls around and do even better, because we have NADAC coming up and they aren’t as forgiving as CPE.